Powered by high-voltage EV batteries, the first premium all-electric vehicle – the BMW i3 – and the BMW i8 plug-in hybrid sports car can be driven with zero tailpipe emissions. As a fast and simple solution for battery charging via a hardwired connection, BMW i offers the Wallbox. At 2015 CES, BMW presented an alternative solution: in a BMW i8 it demonstrated a research application for inductive – i.e. wireless – battery charging. Contact-free power transfer between coils. Inductive charging provides reliable, wear-free and user-friendly EV battery charging using a magnetic field, without the need for a hard-wired connection between the vehicle and the power source. The system comprises a primary and a secondary coil. The primary coil is fitted in a base pad underneath the vehicle, for example on or embedded in the garage floor. 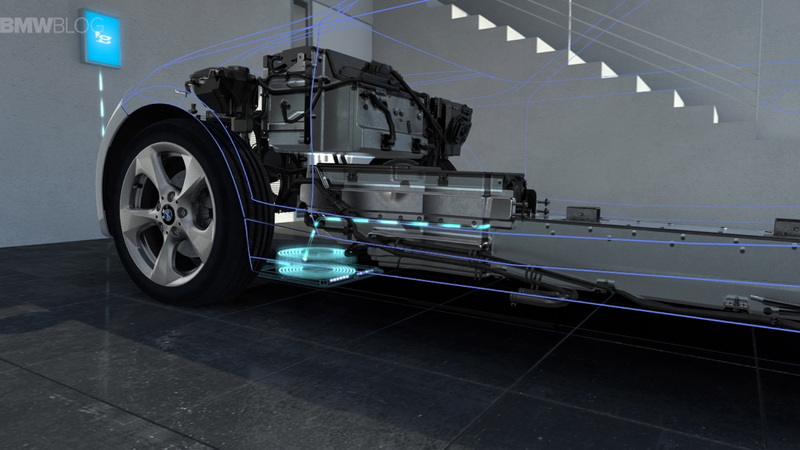 The secondary coil is integrated in the underside of the BMW i8. As soon as the vehicle is positioned over the base pad and the charging process begins, an alternating magnetic field is generated which transmits electricity between the coils. The electricity is transmitted without cables or contacts across a gap of several centimeters, at a charge rate of 3.3 kW. The high-voltage battery of the BMW i8 can be fully recharged in less than two hours using this system – which is approximately the same amount of time required with a wired connection. Future inductive charging systems with a higher charge rate of 7 kW will also allow the larger batteries of all-electric vehicles, such as the BMW i3, to be fully recharged overnight. In typical accessible areas immediately next to the vehicle, the electromagnetic field strength during inductive charging is well below the existing regulatory limits. The electromagnetic radiation is less than that emitted by an induction hotplate on a kitchen stove. Trouble-free inductive charging even in snow or in the wet. The key requirement for an optimal charging process is the correct relative positioning of the two coils. A parking assistant ensures that the BMW i8 is parked so that its secondary coil, which is located centrally between the front wheels on the underside of the vehicle, is positioned precisely over the primary coil in the base pad. The system launches the charging process automatically, but only if the coils are correctly aligned and there is no obstruction to the power transfer – for example due to foreign objects situated between the vehicle and base pad. 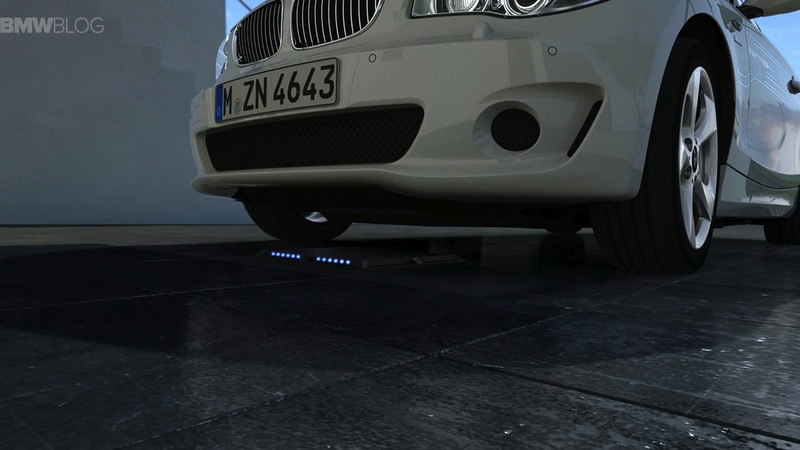 Since all the system’s electric components are protected, inductive charging is possible even in rain or snow. Inductive charging offers important convenience benefits for drivers of electric or plug-in hybrid vehicles: they no longer have to connect a cable to a charging station, for example. At the same time, charging begins automatically and is continuously monitored. This ensures the BMW always offers an optimal range for zero-tailpipe-emission electric driving. Just as when charging the vehicle with the BMW i Wallbox, inductive charging can also be activated and monitored using a smartphone app. Amongst other things the app shows the current charging status, remaining time to complete a full charge and potential driving range. 18 Comments on "BMW Shows Off Wireless Charging"
Toyota was working on one too. I think it’s supposed to be a feature in the gen 2 plug-in prius. While the recharge rate won’t be as good as directly plugging in, this should still come in handy. Hopefully things like this become standard on future EV’s, so that anyone can use any of those chargers with no issues, which will help make them more acceptable to the general public. I wonder what the transmission losses will be in comparison to a plug in connection. They need to be pretty similar or those extra losses would add up over the years. I’d like it better if the coil on the BMW automatically lowered itself down to eliminate any gap between the two coils, decreasing the transmission losses to a minimum. There is a loss in carrying a transformer in the car all the time too. Lots of companies have demonstrated this. Plugless by Evatran for instance. However, the amount of losses is still an issue, as well as total power and cost of the EVSE. Plugless for example costs $892 for the station and about $1100 for the vehicle adapter for charging at 30A, without installation costs. A Tesla 80A HPWC costs $750 in comparison. A Clipper Creek HCS-60 (48A charging) costs $899. biggest issue is that of standards. Right now I can have a single EVSE that can charge any EV. The standard J can charge Volt, Leaf, Tesla etc etc. All of these induction systems are unique – so we have to rip it out when we get another car – or useless if you have two different cars. The tech is cool, but for a big-battery BEV, I think I’d rather deal with the plug and get higher speeds and efficiencies. It’s a cross-post with our friends at BMWBlog, who also post some of our BMW-specific articles. I dare anyone to drive their i8 without any tailpipe emissions. Also, what is the percentage of pure electric (no Rex) i3’s? I guess I’m old school – I prefer to plug in my electric car manually and not worry about the extra hardware or electricity costs, or compatibility issues with different vehicles. I think the better system is the coil behind the front plate and the charger mounted on the wall or even better a post that can be spring mounted. The car can be parked with its nose against the charger. No big gap loss on charging. Considering Tesla had to design extra armor plating for the underside of the car to protect against road debris, maybe your front/wall mounted charger is a good idea. Even better, have the car park itself with it’s nose touching whatever it needs to touch. I’ve had my Plugless system for 9 months now. I love the fact of just parking and not having to plugin. would not go back to the plug and i’m not lazy, just handicaped so not having to mess with a plug when there is ice on the ground is the best and that makes my Volt the coolest car on the planet! The BMW press releases seem to always include this bulls***, “Powered by high-voltage EV batteries, the first premium all-electric vehicle – the BMW i3”. Huge turn off for me with such blatant blow-hard-ness. I would gather some of this is a talking point or bragging point, so although no doubt being very practical, it is somewhat of a ‘Status Symbol’ for your neighbors.